Why not have the complete dosing system delivered in a building! If you are going to purchase a chemical dosing system or water treatment plant and it is to be located at your site, why not purchase the plant already installed in its own building? The benefits are huge, mainly with reduced site installation time and prevention of defects. It makes sense that we can construct the plant at our works and fully factory test it before shipment. No nasty surprises on site, just connect services and switch it on. Application: Building mount sodium hypochlorite dosing and control system, installed in concrete portable building. Chlorine dosing and control is required for top up chlorination of potable water supplies at reticulation and reservoir locations. Dioxide Pacific dosing systems are installed in small portable buildings which can be easily transported to site and placed on a crushed rock base. Once on site, it is a simple matter to connect water in and out and power along with a security fence and the installation is complete. The plant can be up and running in 1 week. Inside the building is a complete sodium hypochlorite storage and dosing system including chemical storage tank with transfer facility, tank bund, by-pass water circulation system so that chlorine can be dosed into this by-pass, chlorine residual analyser with PID controller, electrical control panel, domestic water system with safety shower and eyewash. All safety signs complying with dangerous goods standards and painting of internal walls for chemical resistance are included. The building mount chlorine dosing system is designed in 3D and fabricated at our workshop with full testing and commissioning. Dioxide Pacific will then attend site to connect services, commission the plant on site and provide operator training. Dioxide Pacific was engaged by a consultant to design and build a portable building mounted water treatment plant for a dam site. The owners desired to use dam water for safety showers and ablutions on site but the water was turbid with colloidal clay and required disinfection. The site is an operational gold mine and therefore disruption of site time was to be minimised, hence the choice of a building mount system. Dioxide Pacific provided concept process design and obtained approval from the consultant. PACl dosing and multimedia filtration was chosen to flocculate and remove colloidal clay. Chlorine dosing for oxidation of iron and removal of iron oxide with DMI filtration was chosen prior to UV disinfection. Clean water entered a storage tank where it is circulated and dosed with chlorine again to maintain a disinfection residual. The complete system was installed inside a prefabricated portable building. Chemical storage tanks and bund tanks are located inside the building with vents outside to prevent corrosion. Chemical; dosing pumps are located on top of the tank. All electrical wiring and pipework inside the room was installed and tested prior to delivery. The building was removed from our workshop and delivered to site by truck where it was placed onto blocks ready for connection to site services. The system is serviced under a preventative maintenance contract by Dioxide Pacific. Application: Sodium hypochlorite dosing and control system, installed in plant room shed. Chlorine dosing and control is required for top up chlorination of potable water supplies at reticulation and remote reservoir locations. 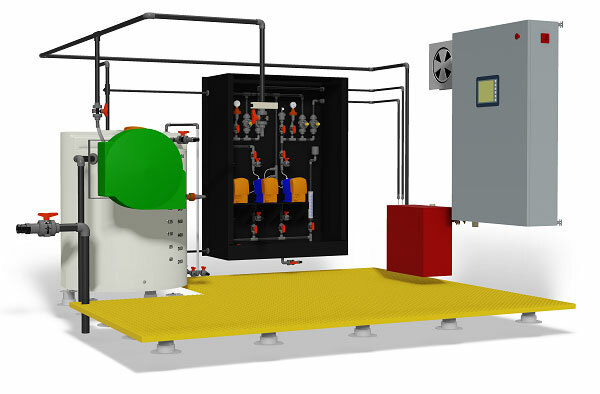 This Dioxide Pacific dosing systems is installed in a plant room where the contact tank is also installed in the room. In some locations such as parks, water consumption during winter and the working week is very low, so water in reservoirs can become stagnant and chlorine residual reduce to unacceptably low concentrations. In this plant, a small chlorine contact tank is installed in series with the reticulation pipework. Water is circulated from the bottom of the contact tank to the top and sodium hypochlorite is dosed into the circulation loop. Level in the contact tank is maintained with a float valve. The complete system was supplied and installed including contact tank, pumps, dosing pumps, valves, chlorine residual analyser with PID controller, electrical control panel, domestic water system with safety shower and eyewash. All safety signs complying with dangerous goods standards and painting of internal walls for chemical resistance are included. Dioxide Pacific was engaged by a municipal water authority to design, build and install a PACL dosing system for flocculation of an emergency water supply. During times of drought, it was desired to utilise a water supply which was normally not used for potable water. This water contains colloidal clay and is dosed with PACl prior to storage in a larger dam. The plant supplied included excavation and construction of a concrete slab, installation of a plant room shed and installation of chemical dosing equipment inside the shed. Chemical dosing includes duty and standby PACL dosing pumps, electrical control panel, IBC bund storage and diesel generator. As the site is remote and chemical dosing occurs infrequently, power is obtained from a diesel generator. The complete system was designed, built, installed and commissioned by Dioxide Pacific including all civil, mechanical and electrical works. There is no limit to the type of chemical dosing or water treatment plant which can be provided in a building or shipping container. For more information on portable building mount chemical dosing systems or to obtain a quotation please press the button at the top of the page. 15 0-20 L/hr (0 – 5 GPH) ? 20 20-200 L/hr (5 – 50 GPH) ? 25 200-500 L/hr (50 – 125 GPH) ? 40 500-1000 L/hr (125 – 250 GPH) ? U uPVC Sch 80 ? C cPVC Sch 80 ? F Carbon steel, PFA lined ? S 316 s/s tube with Swagelok style fittings ? A 316 s/s welded tube and fittings ? B 316 s/s Sch10 pipe ? L PFA tube or pipe ? 0 No splash protection – mounted directly on backboard ? 1 Localised splash protection for pumps only ? 2 Removable splash protection ? 3 Hinged splash protection (doors) ? 0 No leak detection ? 1 Leak detection switch in sump – HC model only ? 2 Leak detection switch in additional drip tray ? 1 Hazardous – Zone 1 ? - Specify max flowrate in L/hr or GPH ? - Specify max pressure in bar or psi ? 1 As 0 + Pulse input ? 2 As 1 + 4-20mA input ? 2 As 1 + 4-20mA calculated flow output ? 3 As 1 + 2 ? 0 No output or not applicable ? 1 Diaphragm rupture output ? 0 No calibration cylinder ? 1 Calibration cylinder sized for 1.5 min of drop test ? G1 Common pressure gauge ? G2 Pressure gauge per pump ? G3 Common Pressure Indicating Transmitter ? G4 Pressure Indicating Transmitter per pump ? L0 No pressure load valve ? L1 Common pressure load valve ? L2 Pressure load valve per pump ? P0 No pressure relief valve ? P1 Common pressure relief valve ? P2 Pressure relief valve per pump ? 0 No pulsation dampener ? 1 Common pulsation dampener ? 2 Pulsation dampener per pump ? 0 No flow switch ? 1 Flow switch on each pressure relief ? 0 No flow monitoring ? 1 Common flow monitoring ? 2 Flow monitoring per pump ? 1 Magnetic flow meter ? 3 Flow meter pulse output ? 4 VA meter with 4-20mA and pulse output ? 0 No flushing points ? 1 Flushing points on pumps ? 2 As 1 + flushing points on skid ? 0 No carrier/dilution water ? 1 Carrier water line on skid ? 2 As 1 + rotameter and diaphragm valve ? 3 As 2 + solenoid with bypass ? 4 As 2 + low flow switch ? 5 As 3 + low flow switch ? 6 As 1 + Option 5 mounted in external cabinet ? 1 1 x strainer ? 2 2 x strainer ? - Specify nominal volume in L or GAL ? M1 HDPE double skinned ? M7 IBC/Tote with spill pallet ? M8 IBC/Tote with fiberglass bund ? M9 IBC/Tote with HDPE bund ? NVI No level indication (opaque tanks visual possible) ? MLI Magnetic level indicator ? L0 No discrete level measurement ? L1 1 x switch: low level ? L2 2 x switch: low and high level ? L3 3 x switch: low low, low and high level ? L4 3 x switch: low, high and high high level ? L5 4 x switch: low low, low, high and high high level ? C0 No continuous level measurement ? C1 4-20mA from tank mounted ultrasonic ? C2 4-20mA from standpipe mounted ultrasonic ? C3 4-20mA from magnetic level indicator ? C4 4-20mA from pressure transmitter (gauge guard mounted) ? 15 0.5” inlet, 1” overflow ? 25 1” inlet, 1.5” overflow ? 40 1.5” inlet, 2” overflow ? 50 2” inlet, 3” overflow ? 0 No load cells ? 0 No actuated valves ? 1 Actuated valve on tank outlet ? 0 No stirrer required ? 1 High Speed Stirrer ? 2 Slow Speed Stirrer ? S Stainless steel 316, IP65 ? S Powder coated steel, IP56 ? MIC Allen Bradley MicroLogix 1400 ? CON Allen Bradley ControlLogix 1756 ? COM Allen Bradley CompactLogix 1769 ? 0 No HMI – lights and switches only ? 1 Red Lion G308 7.5 inch TFT colour ? 2 Red Lion G306 5.7 inch TFT colour ? 3 Red Lion G304K2 4.3 inch colour ? 4 Allen Bradley Panelview Plus 700 - 6.5 inch TFT colour ? 5 Allen Bradley Panelview Plus 1250 - 12 inch TFT colour ? 6 Allen Bradley Panelview Plus 1500 – 15 inch TFT colour ? 7 Schneider XBTGT 12 inch TFT colour ? 8 Uticor UT3-10TC 10 inch TFT colour ? AV All voltages in one panel (24VDC, 220-240VAC, 415-480VAC) ? SV LV and ELV separate panels (24VDC separate to 100-480VAC) ? 0 Bottom cable entry ? 1 Side cable entry ? 2 Top cable entry ? 1 1 tank fed ? 2 2 tanks fed ? 3 3 tanks fed ? 1 Display of level switches ? 2 Display of tank volumes ? 3 1 + 2 ? SF 1 phase, 100-240VAC GPO with isolator ? TF 3 phase, 415-480VAC GPO with isolator ? DF SF + TF ? AD Solenoid for air driven transfer ? B1 Galvanised steel chassis with foam sandwich walls ? B2 Concrete base with foam sandwich walls ? B3 Full concrete building ? B4 20ft standard shipping container - new ? B5 40ft standard shipping container - new ? B6 20ft high cube shipping container – new ? B7 40ft high cube shipping container – new ? 0 Not included (standard building paint finish) ? 1 Inside only (chemical resistance for chemical stored in building) ? 2 Outside only (weather protection) ? 1 Roof fan only (not powered) ? 2 1 + vents in building wall ? 3 Powered fan + vents in building wall ? 1 Fluorescent lamps to suit building size ? 1 One inside the building ? 2 1+ one outside the building ?